Look, up in the sky! It’s a bird, it’s a plane, it’s a… SUPER…ANT? To bugs, trees spell one thing: FOOD! Caterpillars and grasshoppers are connoisseurs of the leafy species. But is there a bright side to trees having ANTS in their pants? Megan Frederickson at the University of Toronto investigates how ants defend trees from herbivores. And in the fields of Peru, she was able to study the Amazonia ant. Ants love delicious insects. So how ants forage for meals relates to how they protect trees from bugs. Frederickson zoomed in on two genes related to foraging. She injected these warrior ants with a chemical that boosted the genes’ activity. What did she get? SUPERANTS! 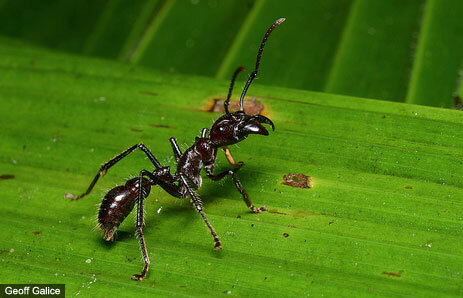 Ants with the activated gene rallied more of their fellow workers to attack harmful herbivores. This left less damage to the tree. So long bugs! Fredrickson’s superants may be super efficient. But mere mortal ants have been protecting trees like this for thousands of years. And the trees evolved to have special structures on their leaves to shelter their ant protectors. Kind of like a leafy Fortress of Solitude? Superant to the rescue!